Turner was born in London to working-class parents. During a career of over fifty years he produced an enormous range of landscapes in oils, watercolours and prints, collecting material through travels in Britain and Europe, especially Italy. Although his achievement was recognised by the art establishment, he was not admitted to its highest honours. His greatest champion was the critic John Ruskin. Turner died at the age of seventy-six. The work he bequeathed to the British nation, which had a profound influence on later painters including Whistler and Monet, is now housed in the Clore galleries at Tate Britain. Whistler was born in America, though he spent most of his life in Paris and London, acting as a bridge between the two art worlds. He became one of the most controversial artists of the nineteenth century, known for his wit and charm, but also notorious for his avant-garde art. When Ruskin accused him of ‘flinging a pot of paint in the public’s face’, Whistler sued Ruskin for libel; although victorious, the lawsuit bankrupted him. Whistler experimented with both subject matter and technique, seeking beauty in modern, urban subjects, and using oil paint and printmaking techniques in new and challenging ways. 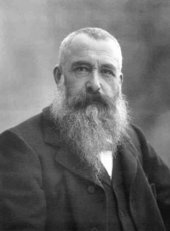 Monet was born in Paris, and spent most of his life in villages along the river Seine. Alert to the work of both Turner and Whistler, he worked from nature, studying the impact of ever-changing light and weather conditions. In 1874 he exhibited his Impression Sunrise, a work which gave rise to the mocking name ‘Impressionists’. Monet visited London several times, spending time with Whistler and painting views of the Thames. He lived well into the twentieth century, creating a garden around his studio in Giverny, just outside Paris, which became the subject of many of his most famous paintings. Ruskin was an artist, art critic and social reformer. The son of a wealthy wine merchant, he was widely-travelled and produced an enormous amount of highly influential writing. Probably his most important work of criticism was Modern Painters 1843–60, begun as a defence of Turner. During the second half of his life he became preoccupied with social reform and other political issues; he used much of his large inheritance for philanthropic work. He loathed the effects of the Industrial Revolution, in particular the way it supplanted older traditions of craftsmanship. His personal life was deeply unhappy. 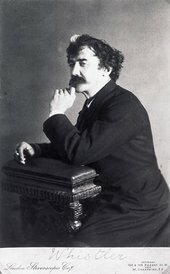 In 1878 he lost a libel case brought by Whistler, and soon after showed the first signs of mental illness that dogged the end of his life.